New York: Stressing that all concerned, including the producers, retailers and consumers, need to be responsible for the progress of business and realisation of labour rights, Prime Minister Sheikh Hasina has urged the global stakeholders to deliver on their commitments on responsible business conduct, fair pricing and access to development finance. “We would benefit more if business is regarded as a shared responsibility by all at home and abroad,” she said. The Prime Minister was addressing the Launching Event of the Global Deal Initiative on Enhanced Social Dialogue for Decent Work and Inclusive Growth organised by Swedish Prime Minister Stefan Lofven in the conference room 2 of the UN Headquarters on Wednesday, reports UNB. In Bangladesh, she said, the government has been following the path of inclusive economic development ensuring that no one is left behind. 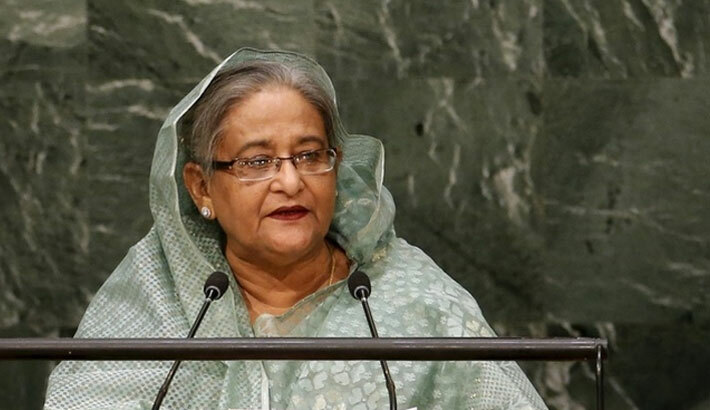 “In our Vision 2021 of Bangladesh, people have been placed at the centre of all our development efforts focusing on people’s dignity, safety and security,” Hasina said. The Prime Minister said the government recognises the importance of further raising the capacity and awareness of industry associations, trade unions, factory management and workers in this regard. “We’ve been closely working with all development partners and stakeholders for a better future for our industries, employers and workers,” she said. Foreign Minister AH Mahmood Ali, PM’s ICT Adviser Sajeeb Wazed Joy, LGRD and Cooperatives Minister Engineer Khandakar Mosharraf Hossain, Expatriates Welfare and Overseas Employment Minister Nurul Islam BSc, Energy Adviser Dr Towfiq-e-Elahi Chowdhury, State Minister for Labour and Employment Mujibul Haque, State Minister for Foreign Affairs Md Shahriar Alam, Chairman of the Parliamentary Standing Committee on the Foreign Ministry Dr Dipu Moni and Bangladesh Ambassador to the USA M Ziauddin were, among others, present.